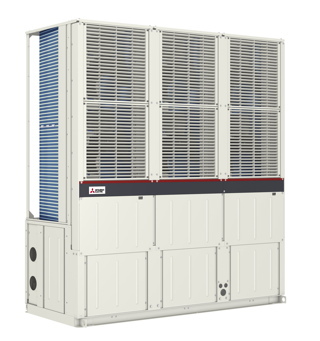 Delivering the benefits of modern chillers — Seb Desmottes. Chillers are tried, tested and trusted products with a stable market — but face challenges from new technologies. Seb Desmottes of Mitsubishi Electric explores how they must evolve. The construction sector in the UK seems to finally be showing signs of recovery after the turmoil caused by the global financial crash, which should mean optimism for the HVAC industry as a whole. Yet despite the dramatic effect of the crisis, sales in one sector — chiller systems — remained fairly constant throughout the period, so there is obviously still a healthy market for this well-understood and much used technology. However, new technologies in air-handling systems and air-conditioning challenge this traditional method of heating and cooling our commercial buildings, so what does the chiller sector need to do to hold or even grow its position? And what are the likely impacts of legislation to the sector? The chiller market in the UK is worth an estimated £92 million per year, with another £23 million for chiller process solutions. Around 80% of units currently sold have capacities of between 20 and 500 kW, and the vast bulk of this is still purchased for cooling-only requirements. However, heat-pump chiller sales are growing, so this should not be overlooked. Of the different types of chiller technologies available (scroll, reciprocating, screw, centrifugal and absorption), the majority use scroll compressors, as they have proved the most flexible and reliable for the variety of building types we operate in the UK. Yet change is coming, and the demands on our buildings and the technologies they utilise is likely to increase as legislation, advanced building techniques and market forces combine. Newer chiller systems can also be installed in a modular manner. There are two key areas of legislation that affect the chiller market. The key challenges for commercial buildings over the next 20 years are energy efficiency and carbon reduction. The Committee on Climate Change is focused on a 50% reduction in carbon emissions from 1990 levels by 2025. As a result, building designers, managers and owners must still comply with Part L of the Building Regulations, which concerns itself with the conservation of fuel and power. This legislation was updated in April 2014 to reflect the increasing focus on carbon reduction, with a new target of 9% improvement on the levels set under Part L 2010. This included the introduction of minimum energy-efficiency targets for air conditioning. There has also been a raft of regulations such as Energy Performance Certificates (EPCs) and the new Energy Saving Opportunities Scheme (ESOS) that were designed to drive greater energy efficiencies in buildings and across businesses as a whole. Other legislation drivers include Ecodesign 2017, Part L 2016, BREEAM and minimum energy-efficiency standards. From April 2018, it will be illegal to let commercial buildings if they have an Energy Performance Certificate rating lower than E.
Achieving a higher EPC will be harder without the use of modern systems and the likely inclusion of renewable technologies in some form or other, so the chiller sector has to find ways of delivering increased efficiency whilst integrating more smoothly with other technologies. Replacing existing old chiller and boiler systems could well be a good place to start to help move commercial premises up the EPC ladder. An important incentive in helping businesses afford the replacement is the ECA (Enhanced Capital Allowance), which allows companies to offset the CAPEX costs against their annual tax bill. However, to achieve this, new equipment has to comply with BS EN14511 which sets minimum European standards of seasonal efficiency for both air-cooled packaged cooling and heat-pump chillers. 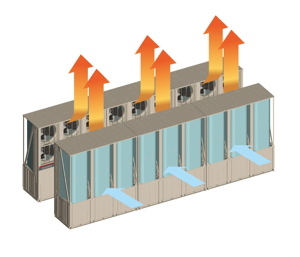 Chillers are rarely seen as a primary target for replacement due to the perceived costs. But a study of the lifecycle costs of installing a new chiller that is far more energy efficient should help to provide a convincing argument. Mitsubishi Electric’s range of e-SeriessChillers offer an ESEER of 5.46 for both cooling-only and heat-pump chillers. Coupled with this, existing chillers can often be dismantled and taken out through existing access points to ease disruption. In many projects, existing runs of pipework can also be used, reducing replacement costs considerably. Newer chiller systems can also be installed in a modular manner and have been designed to reduce plant space and increase maintenance access. At the same time, boilers can be replaced with renewable heating technologies, such as heat pumps, which can be integrated to work with the cooling supply to increase the effectiveness and performance of the system as a whole. This legislative drive towards greater energy efficiency is going to make many landlords and occupants think carefully about the replacement of cooling systems in their buildings. A keen understanding of the benefits of the latest equipment and how it can enhance a building’s energy performance will therefore prove to be an increasingly vital tool for both building designers and equipment installers. Manufacturers have also been keen to show building owners how they can justify the expense of upgrading equipment, with software that will demonstrate the monthly savings that can significantly reduce payback periods. There are also now dedicated finance packages such as our own MELFinace solution which can allow building owners to realise the energy and costs savings in a planned way to minimise the impact on monthly cash flow. The nation has tough energy-reduction targets to meet, and, at the same time, building owners face both legislative pressure and rising energy costs. As the biggest consumers of energy, buildings must be part of the solution and, at the same time, air conditioning is acknowledged as a significant energy user in buildings. The latest chiller technologies help to address this by ensuring that they operate to meet the precise cooling demand of the building. Seb Desmottes is product marketing manager for Mitsubishi Electric.